U Kyaw Htay, a villager in Myanmar’s Myeik township, Tanintharyi Region, used to only do business when the sun was up. With his wife, he runs a small café shop that caters to his neighbors in Ashae Taung village. No one wants to visit a dark café, though. 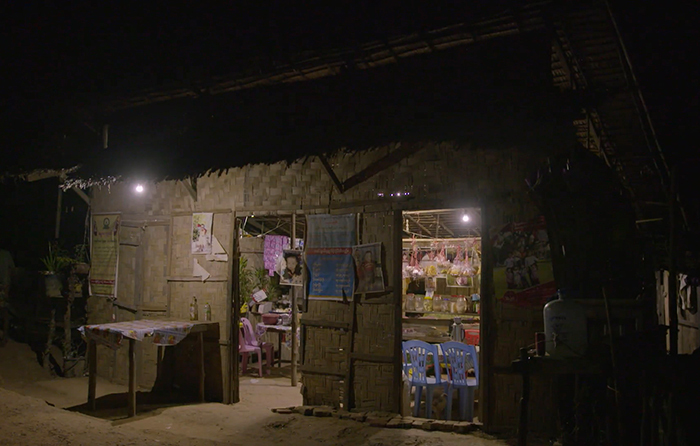 So before U Kyaw Htay gained electricity, they rarely saw customers past sunset, limiting his family’s income. 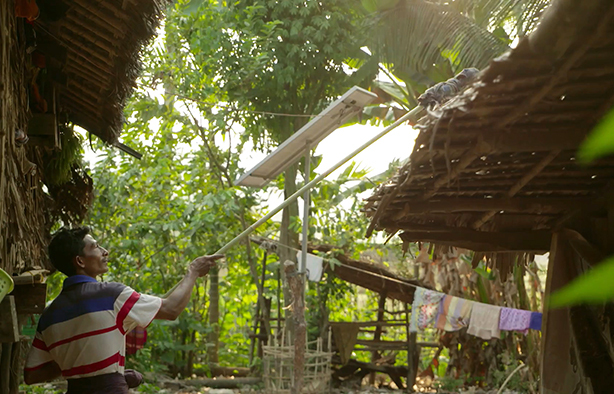 Then came Pact’s Ahlin Yaung project – “Light” in Burmese – which helps remote villages gain access to renewable energy. U Kyaw Htay is among 35,000 people from 60 villages in Myeik and Palaw townships who are benefiting from the project, funded in part by Shell. Before Ahlin Yaung, many villagers spent a large proportion of their income on candles and kerosene just to light their homes and cook over open fires using charcoal and firewood – energy sources that can also be dangerous and damaging to the environment. Now, thanks to solar home systems, they’re spending less and earning more. Pact began implementing Ahlin Yaung in December 2015, in targeted areas of the Tanintharyi Region and Central Dry Zone. The project finished in June 2018. In addition to providing access to renewable energy, the project has promoted improved livelihoods and governance at the community level. Village Development Committees, or VDCs, serve as the primary units for community institution development, with sub-working groups on livelihoods, renewable energy and more. They lead the communities’ participation in activities pertaining to sustainable community development. To help these community development structures operate effectively, Ahlin Yaung also strengthened financial mechanisms through community-owned and managed Village Development Funds, or VDFs. Pact provided the 60 villages’ VDCs with grant funds totalling $13,000. Through the VDCs, community members gained access to loans for livelihoods, renewable energy and social emergencies. By paying back their loans, villagers could contribute to the growth of the funds. Efforts to improve villagers’ livelihoods have focused on agriculture, livestock and fisheries. Following the formation of the VDCs, Pact rolled out several livelihoods interventions. First, vulnerable households received training and access to sustainable financial services to start or grow small businesses. Second, Pact strengthened safety nets for communities, with tools including community-owned and managed revolving funds, seed banks, livestock revolving mechanisms and savings-led community banks managed by respective sub-committees. Pact also introduced its WORTH model, which brings together groups of women to start their own microbanks, save money, access credit and launch small businesses. Each Ahlin Yaung community formed a renewable energy sub-committee to understand the village’s energy needs. Based on assessments, Pact sourced relevant solar solutions and provided high-quality support, including information about how to make productive use of solar power. In addition to solar home systems, Pact identified and supported one pilot project where renewable energy technologies could be used productively by micro enterprises. Pact supported 274 households from 16 villages with solar home system packages in Budalin Township in the Dry Zone through village renewable energy sub-committees. With this support, 1,408 people gained increased access to energy. Households repaid their energy loans through renewable energy sub-committees from March to November 2017. Additionally, the project covered transportation charges for renewable energy committees travelling to the township bank for monthly loan re-payments. The total amount of renewable energy loans repaid to Ahlin Yaung equalled about $16,000, with no defaults in loan collection. With solar power, children have been able to study together and do better on exams, says Daw Than Myint, a teacher in Myeik township. Many of her students had only heard of electric light before Ahlin Yaung, but had never seen it. “They feel happy, as they can study, and I feel happy, as the whole house is lit,” says Daw Tin Ohne Kyi, a mother whose family got a solar home system. Daw Tin Ohne Kyi, a villager of Ashae Taung village, in Myeik township, borrowed the equivalent of about $36 to buy a solar home system through Ahlin Yaung. Go here to read the full report, Ahlin Yaung: Improving Access to Renewable Energy in Rural Myanmar.